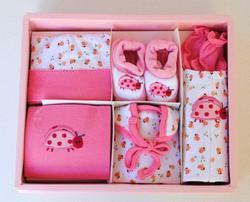 Charming 6-piece, gift boxed, matching clothing and accessories set. Includes short-sleeved T-shirt, pants, hat, bib, mittens and booties. High quality 100% cotton fabric. Striped with cute lady bug, embroidered motif.